Margaret Honda’s films can’t be watched on a laptop or device. It’s not just that they haven’t been digitized and uploaded, it’s that the viewer’s physical experience of viewing the films is so integral to the work that they must be screened, in 70mm and 35mm, in theaters equipped to project them with technical integrity. A sculptor and object-based artist, Honda brought film into her practice in recent years primarily guided by her interest in celluloid film as material and in the systems designed to work with it in the wider market. Her two camera-less films were created with print stock, timing tapes, printers, and the technicians who work at FotoKem and YCM Labs, both in Burbank, California. Still from Spectrum Reverse Spectrum, 2014, 70mm film, aspect ratio 2.2:1, color, silent, 21 min. Spectrum Reverse Spectrum (2014, 70mm, 21 min) moves through the light spectrum from violet to red and back again, with the duration of each color calibrated to match the amount of space it takes up in the visible spectrum. The feature-length Color Correction (2015, 35mm, 101 min) was generated through the use of color timing tapes for an unnamed Hollywood film — a kind of readymade. Leaving out the original film negative, Honda’s film was printed directly from the timing tapes, which control light valves in the printer and correct for problems with exposure, white balance, or color effects. What is seen in the theater is a silent wash of color, bold and vibrant in the case of Spectrum Reverse Spectrum, and more muted and unpredictable in Color Correction. Both material and abstract, the films offer little to enter into, other than the self; there’s no pictorial content, no plot, no sound. The projection itself — and by extension the celluloid, the light, and the technology behind it — is the subject, and the experience of viewing is one in which the viewer orients herself in relation to this event. Honda earned an MA in Early American Culture from the Winterthur Program at the University of Delaware as an alternative to art school. Her training informs her approach to art-making and filmmaking, which hinges on finding new possibilities for the use of production schemes that are already in place, with materials that are readily available, and accepting and identifying the limits and meaning of what they offer. Honda hosted this interview at her studio in her home in Los Angeles, on July 7, 2016. The conversation has been edited for length and clarity. J. Louise Makary: Do you remember the first time you saw Color Correction? I read that you had no idea what this piece was going to be, and you prepared yourself to accept whatever this project would look like. Margaret Honda: The idea was to hand the tapes over to the lab, and I wouldn’t know what it was going to look like until after it was printed. So I was totally prepared to accept whatever happened — if it was a bunch of grays, if it was all blue. I had no idea what it was going to be. In that sense, I was really happy because the finished piece is so varied. So many colors, some that I didn’t know existed and didn’t have names for. And I think because I had prepared myself for accepting whatever it looked like, I didn’t have any expectations of how I would respond to it. I didn’t have an idea for images or a narrative, or anything like that. 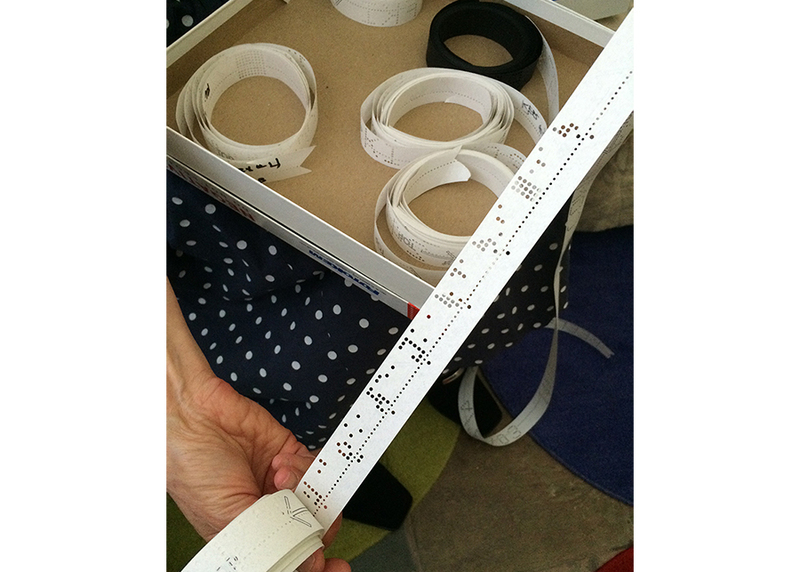 It was the material and the process — how these rolls of paper timing tapes are used— that I thought were interesting. Both Spectrum Reverse Spectrum and Color Correction involve the simplest materials. It’s just timing tapes — and in the case of Color Correction, it’s found timing tapes — and print stock, a printer, and amazing technicians. But then the process of using the timing tapes can yield different results — in this case, two very different works. For Spectrum Reverse Spectrum, I knew that I wanted a very gradual transition through the visible spectrum. The idea came before the development of the timing tapes; the timing tapes were engineered to reflect what I wanted to do. For Color Correction, I used timing tapes for an unknown Hollywood film. So someone else had already made the decisions about how many shots were going to be in the film, how long each shot was going to be, and also what they needed to do to color-correct each shot. The timing tapes encode these external decisions. Honda unspools a timing tape used in the making of Color Correction. Makary: What was your introduction to the process that made you think this would be good material for you? Honda: I didn’t know anything about filmmaking when I started to make Spectrum Reverse Spectrum. I found out that a timing tape had to be generated to control the light valves to print the spectrum and reverse spectrum. So as I was working on that film, I realized that any set of timing tapes could produce a film. That’s how the idea for Color Correction came about.